I’m forever torn when it comes to taking days off for gigs. In an ideal world, every gig worth going to in Tokyo would fall on my days off and the rest of the week would be filled with guff like The 1975 and One Direction (essentially the same band, aside from the fact that one has a few guitars). Luckily, quite a few gigs (like The Charlatans and Stereophonics) have taken place on my days off and I’ve not had to use one of my precious five days discretionary leave to go to them. However some (Vintage Trouble and the upcoming Manics gig in November!) haven’t been quite so kind to me. Swings and roundabouts. 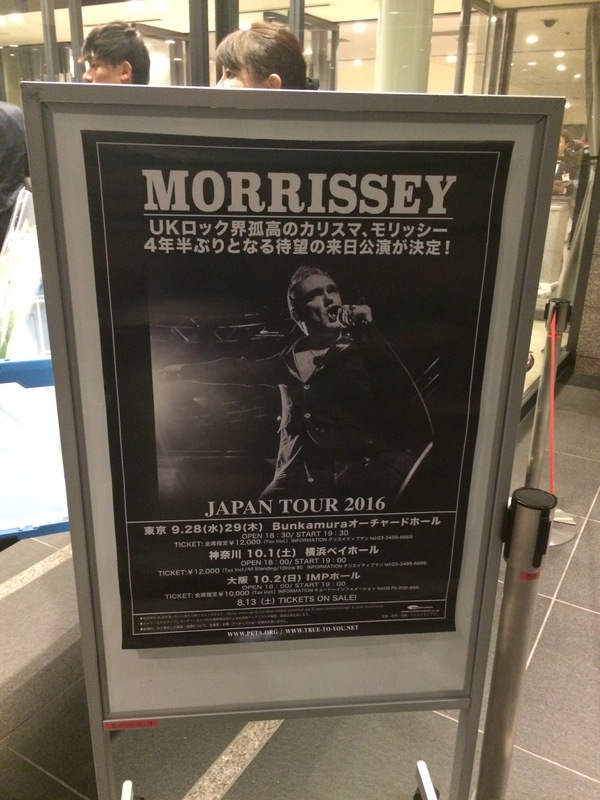 So when Morrissey announced two dates at Shibuya’s Orchard Hall I found myself with something of a dilemma on my hands. Do I take a day off and go to the gig? Sure I love The Smiths, and there’s no denying that some of Moz’s solo stuff is brilliant. He is, on the other hand, prone to releasing the odd album full of shite as well as getting up to other endearing antics like storming off stage after one song. In fact, I’d go as far as to say Johnny Marr’s solo stuff interests me much more these days than Morrissey’s. Standing outside the venue. I was never going to decide against this one, was I? The fact you’re reading this post says that I don’t need to tell you my decision. After a mega productive day off (read: taking a broken rice cooker back to the shop, finally riding the bike I bought two months ago and going to the gym) I grabbed my ¥12,000 ticket (about £90 now, cheers Brexit voters) and headed to Shibuya for the gig. The first things I noticed at the venue perhaps surprised me a little more than they should have. It is Morrissey after all. 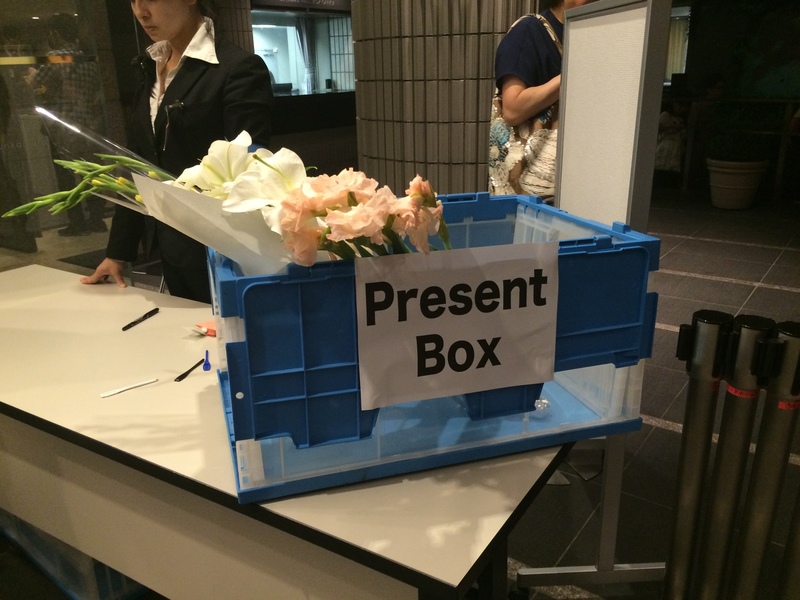 Firstly, outside the entrance was a box marked as ‘PRESENT BOX’. Now, I thought this may have just been lost in translation until I got a little closer and noticed there was stuff inside the box. More specifically, flowers and gifts marked ‘To Morrissey’. He does attract a special type of fan, I guess. I can’t confirm whether Moz or a fan put this here. Secondly, seemingly laid out with no real order at all just inside the door were a number of posters of Morrissey bearing various pro-vegetarian/vegan slogans. Again, not surprising but just a little bizarre. In fact, they drew quite a crowd as everyone gathered round to take a similar photo to the one before. To be expected, I guess. 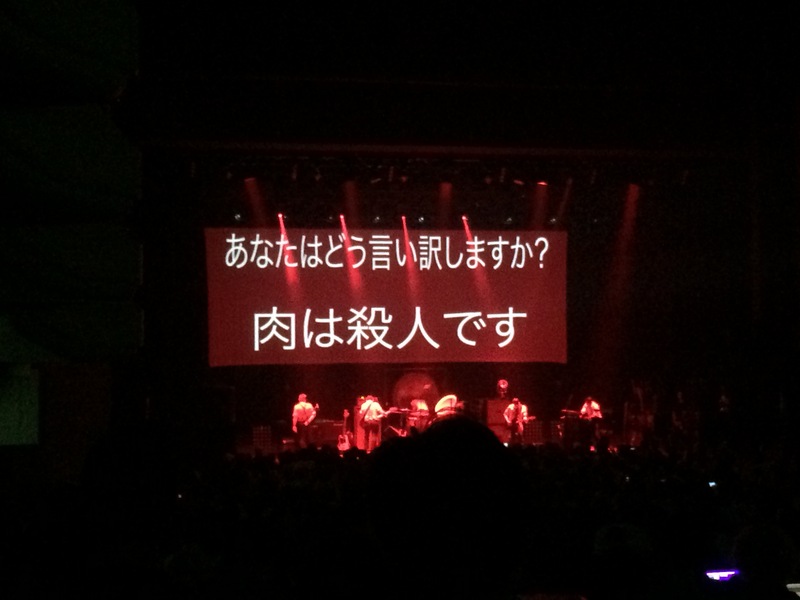 Unlike the U.K. where the stage time for a gig is around 9pm and is more a guideline than a rule, stage times in Japan are much earlier and – as I found out when I missed half of the Tame Impala gig back in April – they’re pretty strictly adhered to. Moz’s stage time was 7.30pm so I quickly downed a beer (I just about had time for that) and made my way to my seat. Unfortunately, buying tickets from the machines at the convenience store isn’t so convenient for all-seated gigs; I couldn’t find a way to select my seat so ended up on row 32! Lesson learnt. As expected, the lights went down at 7.30pm on the dot and there was the standard tangible excitement around the venue. What followed however, wasn’t expected. As all eyes focused on the side of the stage and people tried to get a glimpse of the man himself, the screen on-stage booted into action and started playing a Ramones video. Eh? Next up was ‘Alice Cooper – Elected’, the music video to which featured, amongst other things, a chimp smoking a cigar. Not quite something I’d expect Morrissey to be showing, but what do I know? I spent far too much time looking at this screen for my liking. And it went on. And on. And on. For 35 minutes in fact. 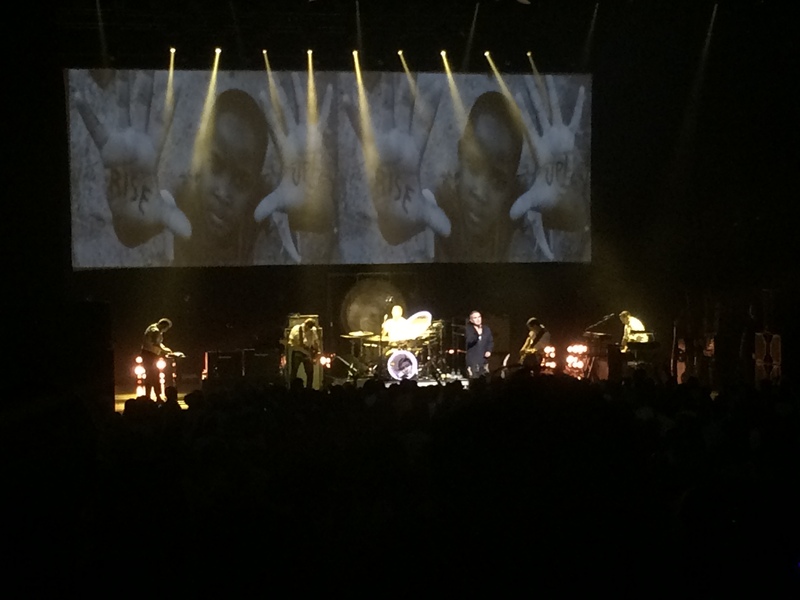 Music videos spanning all genres and a number of decades interspersed with poems and random little video loops until finally, at 8.05pm, Moz and his band took to the stage. I could have had at least two more beers (Japanese measures, of course) in that time. Better late than never though, and what better way to get the audience interested again than by opening with Suedehead? An absolute classic. That’s what we’d been waiting for! This was followed up by Alma Matters and one of my personal favourites You Have Killed Me. All was forgiven and the 35 minutes of tedium in the build up was a distant memory. I missed the next few songs due to a sudden bout of stomach cramps and cold sweats (I’d eaten brown rice for the first time in years, possibly ever, earlier that day – hello fibre!) but a quick look on Setlist.FM tells me I didn’t miss much. In typical Morrissey fashion he had plenty to say about a wide range of subjects. The previous day’s U.S. Presidential debate naturally came up and, as you may expect, he didn’t have anything complimentary to say about either candidate. Just when I thought I’d seen enough video to irritate me for one evening, he finished off this speech by saying something along the lines of ‘Speaking of problems in America…” and bursting into Ganglord. Now this is a great song which was somehow only a B-side, but it was hard to concentrate on the music when the background video was showing footage of police brutality in the States for the duration of the song. He doesn’t half know how to please a crowd, ol’ Moz. The trick would be repeated later in the set when The Smiths’ classic Meat is Murder was accompanied by some incredibly graphic footage of slaughterhouses around the world. A clear message, although not a particularly pleasant one. I suppose it should be expected; when you buy a Morrissey ticket you’re paying for a lecture as well as a gig, but it was still a bit much for me and my rather delicate stomach. 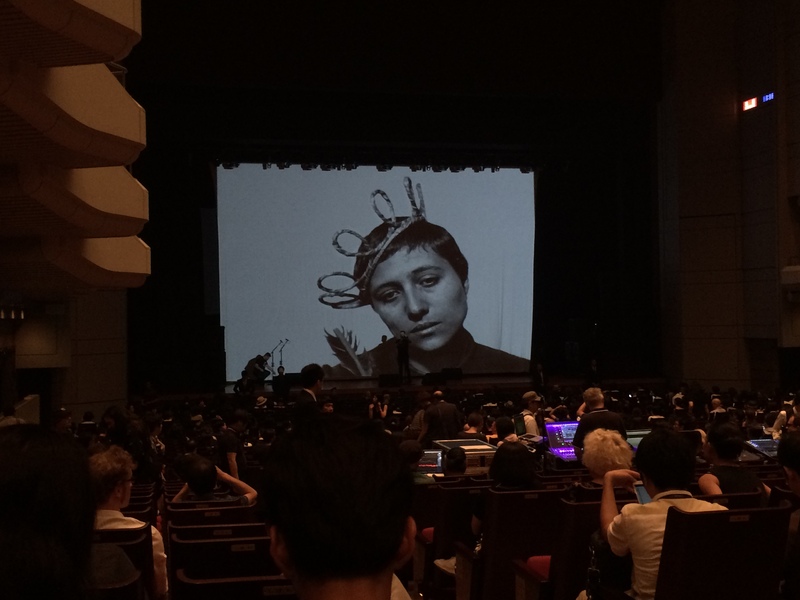 This was on the screen at the end of Meat is Murder. I’m not sure I want to know what it says. I have to admit I was expecting a set more focused on 2014’s World Peace is None of Your Business album so I was pleasantly surprised when only three songs were played from that album (although not the brilliant Staircase at the University, unfortunately). As a bit of a fleeting Morrissey fan, I was blown away by the epic Speedway which was a song I’d probably only listened to once in my life beforehand. Perhaps predictably though, the highlights of the night were the songs I was most familiar with. The stripped down, semi-acoustic, latin-tinged rendition of First of the Gang to Die added an extra dimension to an already brilliant song, whilst the old classics Every Day is Like Sunday, You’re The One For Me, Fatty, and How Soon is Now were as good as I expected. In what is becoming something of a pattern, just like Stereophonics did a few months ago, Morrissey managed to miss out the one song I really wanted to hear. It’s hard to complain too much after an enjoyable gig, but I was a little disappointed to not hear Irish Blood, English Heart. Right up until the very last song (The Smiths – What She Said, by the way…) I was holding out hope but it just didn’t come. I suppose with a back catalogue that big it’s got to be hard to please absolutely everyone, but to miss out such a popular song seemed a shame. Then again, he’s never really been one for doing things by the book, has he?